it to me. My mother used this recipe a lot, and gave it to me from memory. My grandmother and mother never wrote recipes down, but luckily, I did. I had to play with this a bit to make it work well, because everything my mother said was an "about"...about 2 cups of flour, about 4 tsp baking powder, etc. I know she owned a measuring cup, but I'm not sure she ever used it. 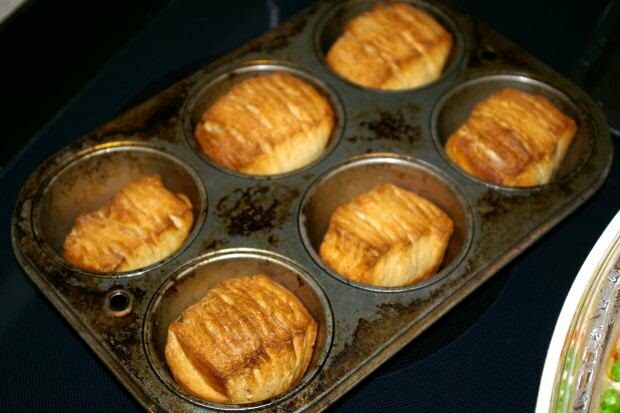 I've eaten these all my life, and whenever I went home, I would make my mother make her famous "biscuits". It wasn't until years later that I learned from my aunt that I had been eating English scones from an ancestral recipe passed down from mother to mother for over 300 years in America alone. Preheat oven to 400 deg F.
Beat one egg lightly, add to cup and then add milk up to 3/4 cup liquid. Add milk/egg mixture slowly to dry ingredients, mixing as you go. Dough should be soft, but not wet or sticky. Work dough into a ball with your hands. Flour your working surface, place the dough ball in it, and pat down with fingers until about and inch and a half or so. Of course, you will use the scraps and repeat the above steps. Nothing goes to waste. My mother sometimes rolled out the remaining dough into "snakes" and sprinkled them with sugar and cinnamon as treats for us. ** You can beat another egg well, and brush the tops before baking, or you can brush with melted butter. My mother used butter. I think my grandma used egg, but I'm not really sure. Bake for about 12-14 minutes, until golden brown. ** My mother used to add 1/4 cup sugar and a teaspoon of vanilla and probably a little more milk and bake these in muffin tins. She just called them "muffins", but my aunt said they were cream scones. Whatever they were, they were delicious.